Farmers across India can’t seem to escape the microfinance debt trap. Some are even driven to commit suicide. What could save their lives? While his two young sons played outside his house and laughed, Mohan was pondering over his debt. He wasn’t going to kill himself over it, he said – even if his parents had. Like a contagious disease, the debt first afflicted Mohan’s father, who, unable to pay back his loans, poisoned himself. Then, it spread to his mother, who inherited the debt after her husband’s suicide. For almost 4 years, she tried to scrape the money together. 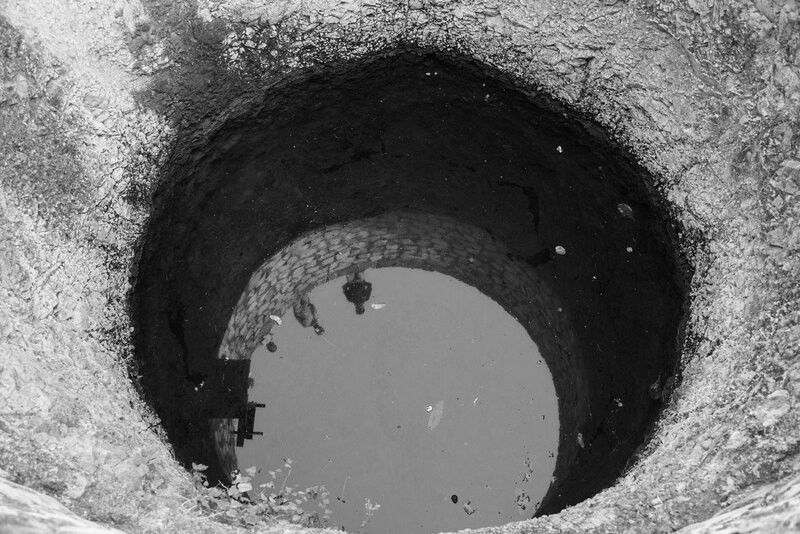 In the end, she jumped into a well. Now, the debt was Mohan’s to pay off. In the three years since we first visited this family in central India’s Maharashtra region, the only thing that remained unchanged is the family’s cow: As before, we found it tied to the house, immune to human inventions like money and loans. Before tending to their farmland in the early morning, most men in the village joined our conversation in May this year. All of them had loans, because there was no other way to get money to replace old and broken farm tools or buy new seeds. On top of that, all of them had difficulty repaying the loans, but usually kept this to themselves. On the one hand, they were ashamed, but they also didn’t want anyone to know about their debt as it’d make it harder to get another loan. When we visited, sowing season was near. Last year’s harvest didn’t bring enough profits, and so, to buy new seeds, Mohan would have to take out another loan. Of the 200,000 Indian rupees (about US$2,900) his father had owed – more than the average income of a farmer over two years – he had already repaid Rs160,000 to the State Bank of India. On top of the outstanding Rs40,000, Mohan took out an additional loan of about Rs70,000 in his own name. Such amounts are common; in Maharashtra, almost 60 percent of households had outstanding loans of on average Rs54,700, according to the National Sample Survey Office. Most of these loans are given by institutional lenders like co-operative societies and banks. In Mohan’s case, the State Bank of India had given him the loan. The bank did not reply to our request for comment. Private money lenders account for a minority of loans. 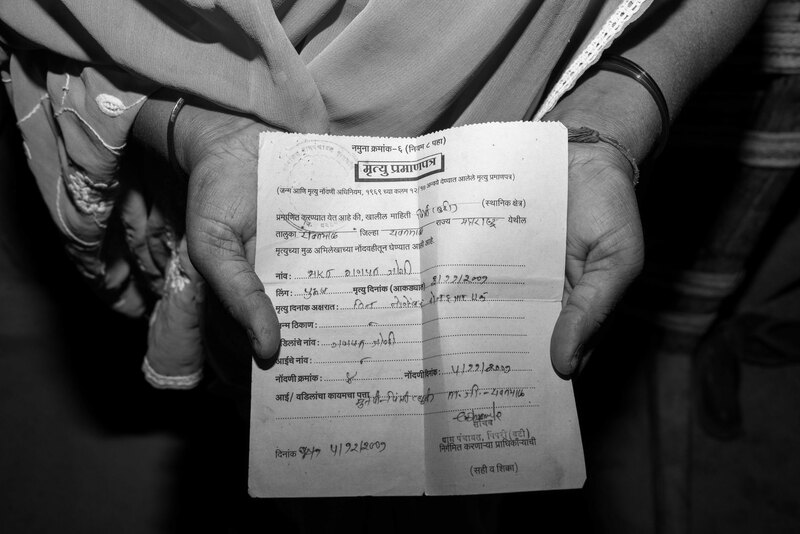 The Indian government offers Rs100,000 in support to help people pay off loans if they’ve been inherited from next of kin who have committed suicide – but only if that debt comes from government institutions like national banks, and not private lenders. Mohan had to use most of this payment to invest in his struggling farm. Pests like last year’s pink bollworm are becoming more frequent, difficult access to market places and dependency on middle men have squeezed margins for cotton, soy beans and lentils, and climate change has brought devastating droughts that have decimated harvests. But the banks, private lenders and microfinance institutions were relentless: Dead or alive, the loans had to be paid back. They have held spouses, parents, children and even neighbours responsible for the outstanding loans of a late debtor. Some, as our interviews showed, have committed suicide to escape, but their debts remained, leaving a trail of despair. The hopelessness these loans left was beginning to become clear to us. We could feel it, looking at the men and their entire village. “Every single night I drink to forget,” confessed Gajanand Jogi. The vast majority of his village did, too. In January 2017, the Indian National Crime Records Bureau released data for the first time about the causes of suicide among farmers. It stated that farmers’ suicide is of “vital concern” that needs to be addressed by the government – half of the populous directly or indirectly depends on agriculture. The major cause of farmer suicide in 2015 was found to be bankruptcy or indebtedness at almost 40 percent, twice as high as the previous year. 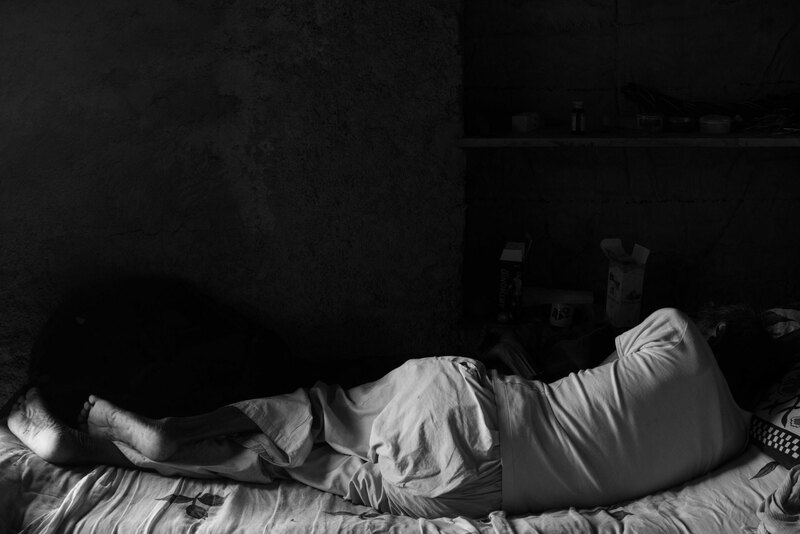 Crop failure or drought, listed as Farming-related issues, were the reasons for about 20 percent of suicides. 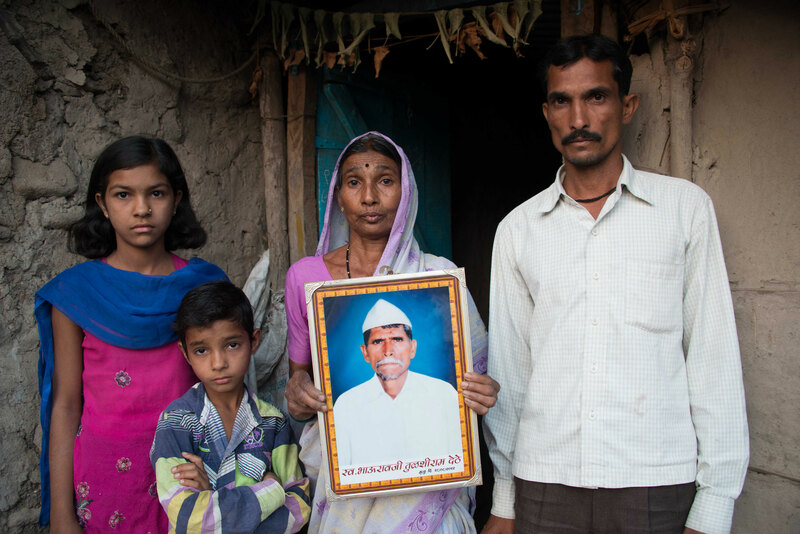 In Karnataka state, debt was the main reason for as many as 4 out of 5 farmers’ suicides. In Maharashtra, it was slightly higher than the national average, at almost 43 percent. If we want to understand why so many farmers are so indebted that they commit suicide, we have to understand why they are indebted in the first place. Kishore Tiwari, chairman of the Farmers Distress Management Task Force and leader of the farmers’ advocacy group Vidarbha Jan Andolan Samiti, can explain the issue’s complexities. “Farmer suicide is the indicator. It reflects what is the depth of the crisis,” he said, explaining that farming-related issues and debt are closely linked. Pests, droughts, low sale prices for crops, economic recession and social stress together lead to indebtedness and thus the suicides among farmers, according to Tiwari. “People are in financial difficulties. That’s the truth,” Tiwari continues. The fact is that farmer suicides are not a new phenomenon in India. In 2005, the All India Biodynamic and Organic Farming Association wrote to the Mumbai High Court expressing concern over farmer suicides. The association was concerned about the 644 suicides reported in Maharashtra between March 2001 and December 2004. (For comparison, in 2015 alone, that figure stood at a staggering 3,030 suicides.) Back then, the court acknowledged that it needed to investigate the reasons. In 2005 and 2006, the government closed 50 branches of four microfinance institutes (MFIs) in Andhra Pradesh following allegations of unethical collections, illegal operational practices, such as taking savings, and high interest rates. However, the sector did not stop growing after that, and unethical collection practices continued. Having multiple loans per borrower was widespread, and, by 2010, the average loan amount per household in Andhra Pradesh was triple that of the next largest state, the World Bank found. Subsequently, reports were coming out that linked these debts with the rise in suicides. The Reserve Bank of India stepped in and issued a series of regulatory guidelines to control pricing, margins, provisioning and methods of recovery. However, the regulatory framework and continued strong financial performance (outside of Andhra Pradesh) actually brought extra funding into the sector and enabled growth, according to a study by the Smart Campaign, which advocates for embedding client protection principles into the microfinance industry. Now, experts are sending out warnings again, like M.S. Sriram, a faculty at the Centre for Public Policy at the Indian Institute of Management Bangalore, who found that the sector was growing “at a frenzied pace”. “The sector is showing signs of overheating, and many are predicting a 2010-like bubble building,” he found in a 2016 report on finance in India. The report notes that several clients had outstanding loans from over five sources, and that, as some institutions are receiving reports of clients’ suicides, industry watchers are expressing deep worry on the phenomenon. “Farmer suicide is turning [out] to be the genocide by the state,” Tiwari states in the above video interview, and so we went to talk to the government. What are politicians currently doing to protect and help farmers? 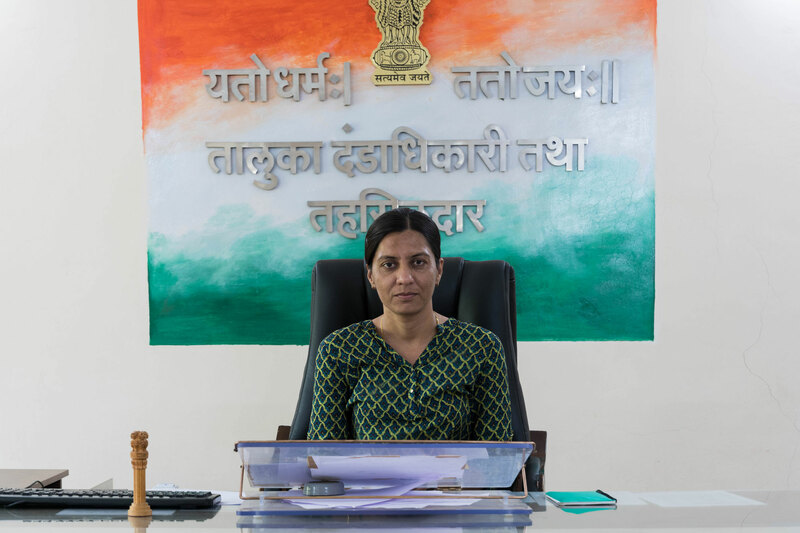 The District Office of Deoli, where Mohan lives, collects data about farmer suicides there, and recognizes the issues, Bulutai Bhagwat, the district officer and a former police officer, said. One of its initiatives is trying to increase farmers’ income, for example, by offering 150 villages the opportunity to receive a Rs1,500 subsidy to set up silk worm farms. But, only three villages, she said, were interested in the project. “I don’t know why others don’t at least try,” Bhagwat said. To find out, we made our way to those villages: Bhidi, Fatehpur and Sonegaon. In Sonegaon, we learned that the silk farm closed down 2 or 3 years ago. In Bhidi, they started a silk farm 1.5 years ago, but haven’t produced any silk yet. The Mulberry trees needed time to grow, the farmers there told us, making it difficult to feed the worms the first 2 years. When we started asking around in Fatehpur, two men on motorbikes came to show us their silk farm. “At first, the silk worm didn’t work. 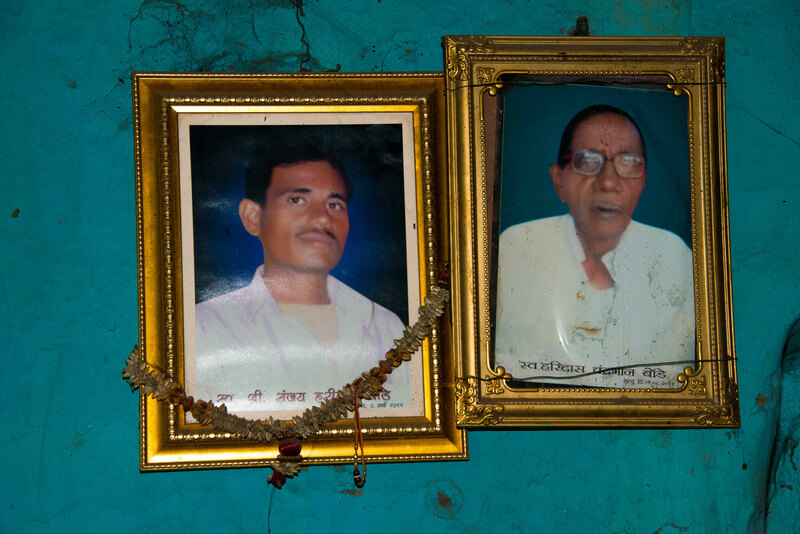 They simply died from the heat”, Amol Malotrao Dhakulkar, a 27-year old farmer, said while chewing tobacco. It was May and, at 45 degrees Celsius, the hottest month of the year. The men realised the worms needed shelter from the blistering sun to survive. The government said they’d help, but didn’t follow through on its promise, he said. “So, we decided to make one on our own,” he said, pointing to the repurposed cow shed in the middle of a cotton field. Although they got a subsidy, the men had to learn about silk farming on their own. They asked a successful silk worm farmer for help, but their first harvest had come at a cost of almost Rs10,000 for trees, worms and laborers. The revenue, however, was only Rs13,000, leaving meagre profits to split between the three families who had invested. “That’s not enough for three families to live from,” Dhakulkar said, explaining why they still needed to farm cotton, soy beans and lentils. The biggest advantage of the silk worms, however, is that they aren’t affected by too little or too much rain – they simply need to be protected from it, and, for that, the families are planning to build a larger, rainproof shed. 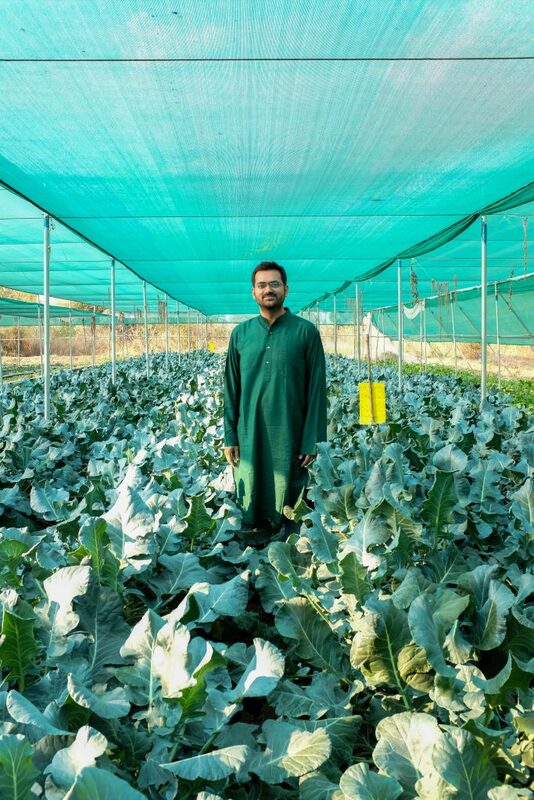 At Garniche, vegetables and fruits are produced for the local market, instead of cash crops like cotton, which are exported – one of many initiatives he plans to boost farmers’ income and resilience. Panpaliya believes that, for the suicide rate to drop, farmers’ have to be saved from falling into debt traps in the first place. But what options are there for farmers who are already indebted? If farmers find themselves in financial difficulty, there is hardly any leniency, according to the Smart Campaign. The report surveyed staff from several Indian and international MFIs, NGOs, trusts and cooperatives. It found that microfinance in India is, for the most part, facilitated through group-based systems wherein individuals are responsible for each other’s loans. In practice, this group-based model means that peer pressure is commonly used to collect payments. A lender can pull in group members, family members and neighbours when a person skips payments. Meetings with the debtor could last 5 to 6 hours – as long as the MFI employees needed to get the debtor to pay. This seems to be the standard operating mechanism, while negotiating with defaulters is the exception. One MFI staff member reported that there were only three genuine reasons for default: migration, drought and health emergencies. Only under the right circumstances could the regional manager decide to show leniency – pests like last year’s pink bollworm or low market prices didn’t count. The majority of MFIs, however, don’t have formal policies for negotiating with defaulters at all. Overall, defaulting on a loan will lead to a bad credit rating, making it practically impossible to get another loan. “Defaults were rare because clients have been informed from inception about the implications of having a bad credit report,” the report said. MFIs don’t offer to restructure loans, because clients will eventually come back to pay off old debts. The Reserve Bank of India has tried to create Financial Literacy and Credit Counselling Centres (FLCC) that were supposed to help distressed borrowers to negotiate a debt management plan. “However, an evaluation in 2012 revealed that FLCCs were underutilised, poorly promoted by the banks, and not reaching the target clients,” the Smart Campaign found. To prevent more farmer suicides, regulators and banks will have to implement a plethora of measures, including working on feasible repayment plans, overhauling the lending system to better account for a client’s means to repay a loan, and a different approach to debt collection. At the same time, the Indian government will need to find ways to improve farmers’ livelihoods so that they don’t fall into the debt trap in the first place. Arguably, that is a Herculean task, but some farmers are already a step ahead of the government. Dhakulkar and Meshram, for instance, who are successfully running a silk worm farm, said that their next venture is pearl farming. “We saw this video on YouTube of a man in India farming pearls in a pond,” Dhakulkar said. Mohan’s full name is known to the author, and although he agreed to speak to Global Ground and have his story published, we have decided to use his first name only in order to protect him and his family. If you need help or know someone who does, please reach out now through a suicide hotline near you. Cover illustration by Imad Gebrayel. Audio story and video editing by Melanie Hall. Update 20 November 2018: A reader pointed out that according to PETA the production of silk can lead to animal harm. When asked what happened to the silk worms Dhakulkar and Meshram responded they fly away when they turn into moths. Even though we did not see any silk worms being harmed, we think it’s important to offer a complete picture of silk production in India and want to thank the reader who shared the PETA article with us! Update Map 10 December 2018: Some of the wording was changed and the brackets are now the same for the data in 2014 and 2015. This article cost 4584,60 EUR (5248.61 USD) and roughly 640 hours to make. We visited the people mentioned in this story several times during three years. Please help us offset some of the costs by donating. Click here for a breakdown of the costs. Get our free in-depth report Microfinance in India with industry information, analysis and recommendations for MFIs and governmental programs. Please fill in your email address.